A rare portrait of an early computer has been rediscovered after a plea by its artist and The National Museum of Computing (TNMOC), where the computer itself has been fully restored to working order. 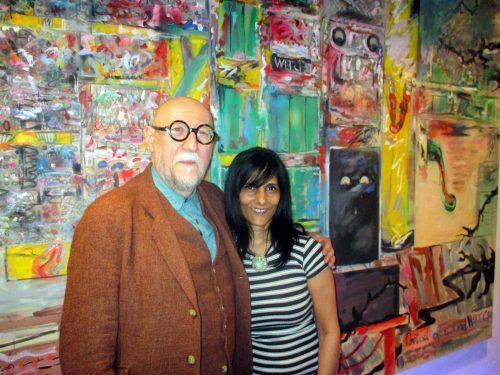 Kaldip Bhamber, an art lover, recently bought the huge painting to display in her Jam Street Café Bar in Manchester, a city renowned for its early computer heritage. Original artist John Yeadon and computer expert Kevin Murrell saw it last evening [ Feb 29, 2016 ]. The Portrait of a Dead WITCH was painted in 1983 by John Yeadon after he had seen the original machine, the Harwell Dekatron / WITCH computer, in Birmingham’s Museum of Science and Industry. The computer itself was rediscovered dismantled and in storage in 2009 and moved to The National Museum of Computing on Bletchley Park where it was restored to become the world’s oldest original working digital computer. The existence of the painting came to the attention of the Museum only last summer when it came across a reference to it in the Morning Star newspaper. The artist was disgruntled that it had been auctioned off by a public body. Intrigued, Museum staff launched a campaign with the artist to find it. The almost life-size 2m high by 3m wide painting, like its subject, has a fascinating history. It was created by artist John Yeadon when he became mesmerised by the ‘dead’ machine then on display in Birmingham. He described it as “a diabolical contraption, a dusty hunk of electric and mechanical hardware that reminded me of the disturbing 1950’s Quatermass science fiction television series”. Yeadon wanted to give the dead machine life, “but with humour and menace”. For many years the painting was part of the Leicestershire Artworks Collection and then lodged with a school, but much to the chagrin of the artist, it was auctioned off privately last year. At that point, the painting seemed to disappear. John Yeadon’s search for it came to the attention of TNMOC which then launched a bid to find it.